It was wonderful to be with Charlene! We had a fantastic time being with our family in such a fun place!! Melissa was well prepared and brought ponchos for everyone for the river ride in California Adventure! We rode it three times!! Matt, Ben, and I wore snazzy glasses to better hit targets in a shooting ride! Matt is the champion and earned way more points than anyone else in our group and was one of the highest scores for the day!! I had an absolutely fantastic time visiting Disneyland and California Adventure. It was wonderful because Charlene joined Matt and Melissa in Phoenix and they all drove together to Anaheim. John, Michelle, and David were able to join us our first evening together and the second day when we visited Disneyland! It was wonderful to have everyone all together at such a fun place! What a wonderful group of family that loved being together!! Ben and I had a great time riding the carousel together!! The Soaring ride in California Adventure was beautiful and one of my favorite rides!! It was inspiring to see video of so many gorgeous places around the world! It is difficult to summarize all the fun activities, laughter, and rides. I used my phone to take photos, so the quality was not as nice as my regular camera, but it allows for more spontaneous moments to capture fun images! Ben and I had fun seeing all the fish caught in the nearby water! Melissa laughed at me getting ready to be drowned in the river ride!! The Disney parade was awesome!! I loved all the songs! Since Disney now owns Star Wars, one of the highlights of the time was to meet Star Wars characters and have our photos taken with them. Darth Vader was very tall and absolutely as intimidating in person as I remember him in the movies. Chewbacca was wonderful to meet too! One of the amazing highlights of our time in Disneyland was meeting Darth Vader! His voice is every bit as scary as I remember from the movies. Melissa had inside connections that enables us to meet him!! It was amazing to meet fun loving Chewbacca!! He is huge! I never expected to meet Star Wars characters! This was an unexpected discovery for Matt, Ben, and me!! It was wonderful to be together with Charlene! I have been on this RV trip for about 6 weeks and it was great to be together. Although we talk on the phone daily, it is not the same as face to face communication. We had a wonderful time together. It was especially wonderful to have so many family members together in one place! We had s’mores on the beach and they were terrific! I had to fly to Newport Beach to help with some training programs. It is a very beautiful area and I identified a RV park in a very beautiful area for a future trip. We had an evening on the beach eating dinner and then making s’mores after dinner. The scenery and weather were beautiful. 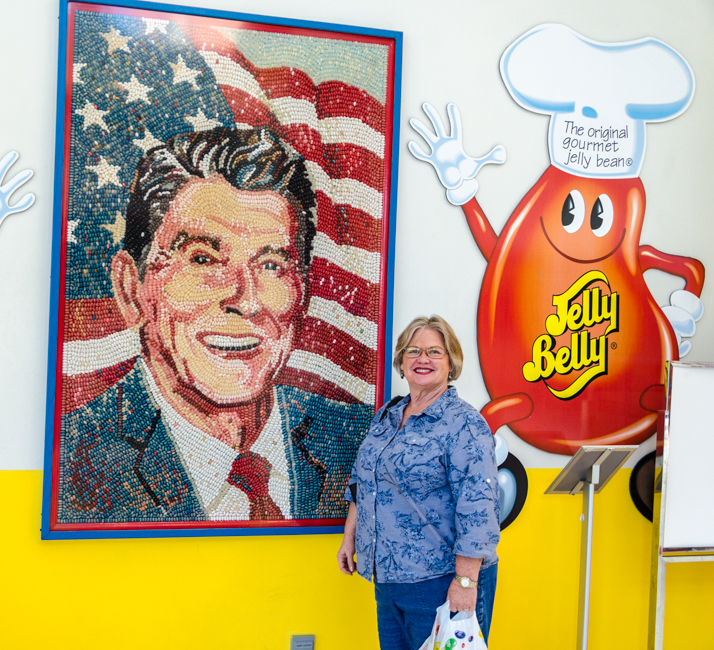 There were several displays of Ronald Reagan and jelly beans. This portrait was made out of jelly beans. 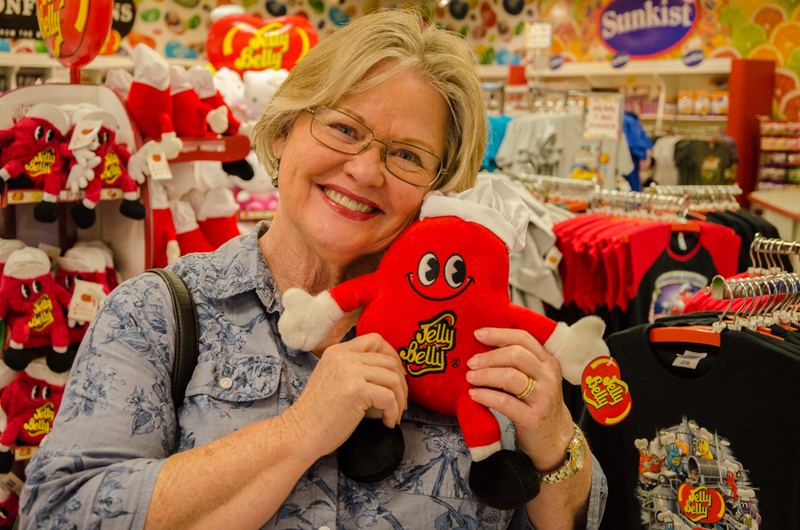 Today we toured the Jelly Belly jelly bean factory. It was quite fun to see how jelly beans were made and how many days it required to make them. Most of the flavors were fantastic, but they certainly had some purposely bad ones too. Yuck! Blueberry, coconut, and pumkin, etc. were nice, but vomit and ear wax were no thank you. Be careful to not get these flavors mixed up! Although most of the flavors were fantastic, they had some yucky ones too. After touring the jelly bean factory we drove through Napa Valley and the Silverado Trail. It was fun driving around seeing the names of wineries we recognized. Grapes were growing everywhere and it was one winery after another along both sides of the roads. 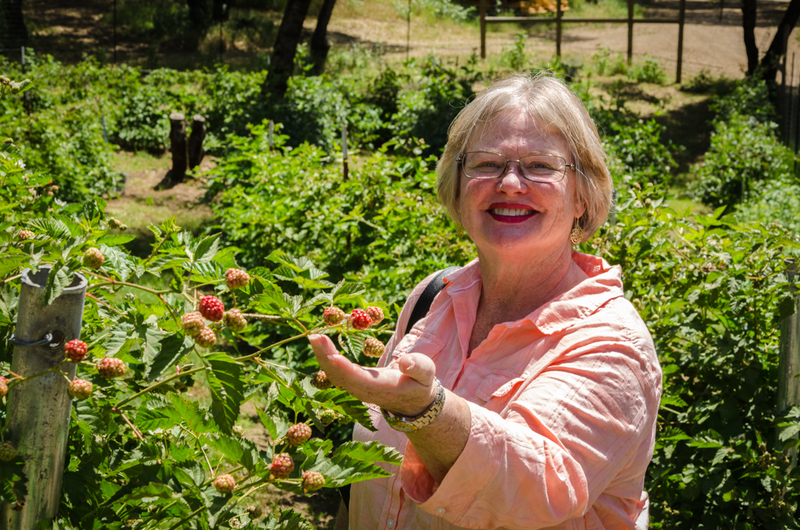 We stopped at Sequoia Grove Vineyards and tasted all kinds of white and red wines. We bought 3 different kinds of wine to save for Thanksgiving. Today was very tasty indeed. We are learning all kinds of things while on this RV adventure. Some are unexpected. For example, the need to be flexible is one of the unexpected things we are learning. Charlene and Ed could be described as analyzing everything. Literally everything. So, the need to be flexible flies in the face of their compulsive need to analyze. Too bad, sometimes RV’ing simply requires unexpected changes to plans. In our latest example, we had requested mail to be delivered from our address in Texas to arrive before we left Coarsegold, California. When we checked the tracking number online, the Post Office predicted our package would arrive by Saturday. However, it appears that someone in Houston put our envelope on the wrong truck and sent it to who knows where. Surprise! So rather than leaving on Saturday and remaining steadfast to our original plans, we had the “opportunity” to choose flexibility and stay a few more days in Coarsegold. We actually loved the time in such a beautiful area which included finding an ice cream shop in Oakhurst. Ed checked the tracking number on his cell phone Monday morning and it said our package was out for delivery in Coarsegold. We packed everything up, hooked up the Jeep to the motorhome, and drove down to the office to wait for the anticipated delivery. Normally mail is delivered by 9:30 am, but by 10:00 there was still no mail lady. We waited in the campground office and chatted with the nice office staff. During our conversation we learned that the campground often has families from Germany stay. The campground owner marveled that the children of these families will swim in the pool when the water is about 70 degrees! There is no way we could do this; Charlene needs it at least 80 and Ed prefers 90. As we pulled out of the campground where we had spent the last two weeks, we looked at each other and asked, “So where do you want to go now?” It’s a weird feeling to be driving down the road with no idea where you will be that night. Our only schedule is being in Reno, Nevada, on Thursday since Ed will fly out of their airport to attend a meeting for several days. Boondocking (thanks to our generator and big tanks) is always a possibility. Our memories of boondocking near Lake Mead still bring smiles to our faces. Or would we find a nice RV park with now-unknown amenities. The decision came down to jelly beans. And not just any jelly beans, Jelly Belly jelly beans! 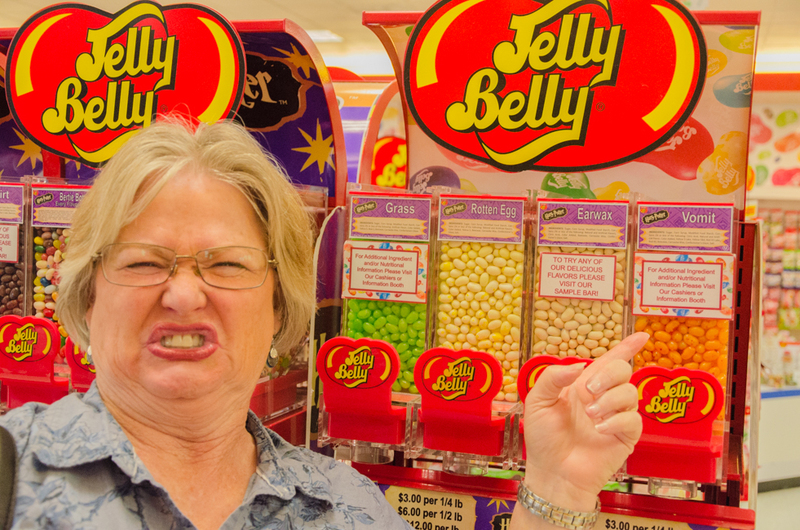 Charlene discovered a jelly bean factory in the Sacramento area and our plans were set. We could have chosen Napa Valley although it would be a little further than we wanted to go; with its many fabulous world-renowned wineries; but no, our plans orbited around a tiny jelly bean. How many people in American make their decision of where to sleep because of jelly beans? Probably not too many, but that would be us. We looked for an RV park close to the jelly bean factory and boogied down the road. A nice benefit is that we are actually now quite close to Napa and Sonoma. Although jelly beans are our priority, we will be forced to check out some wineries too! While Charlene was driving, Ed was reading on the Internet about jelly beans. We learned some important jelly bean trivia. 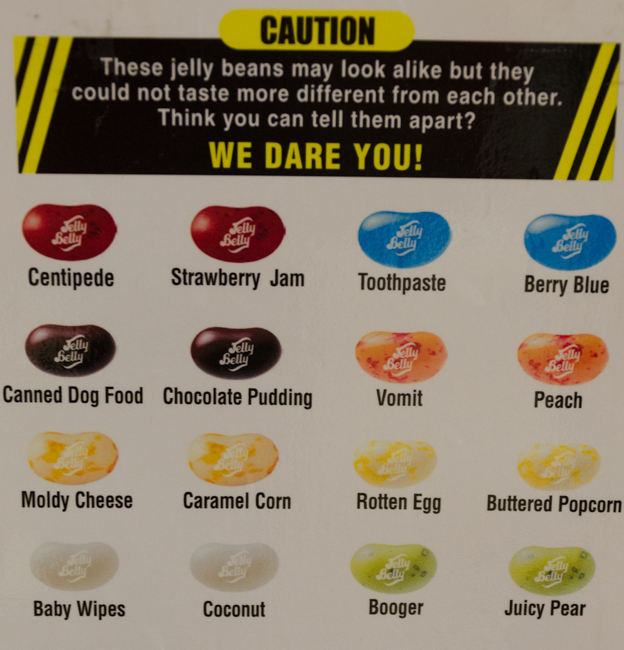 Charlene was quite excited to learn that in 1998 Buttered Popcorn became the number one jelly bean flavor in America by displacing Very Cherry that had been the number one flavor for two decades. Not many people love popcorn as much as Charlene. 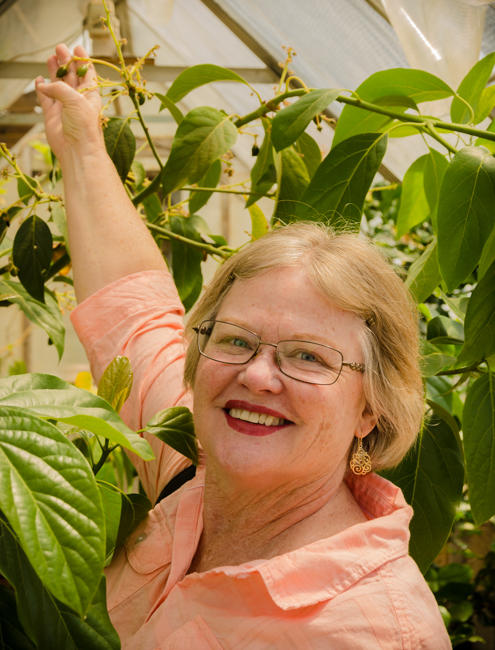 However, Ed was relieved that America had come to its senses and Very Cherry has moved back to the top spot since 2003, but only by a mere 8 million beans. We had forgotten how much Ronald Reagan loved jelly beans. The blueberry jelly bean was created for Ronald Reagan’s presidential inauguration in 1981 and over three tons of jelly beans were consumed during the inauguration festivities. No doubt about it. We are learning some important facts on this trip! 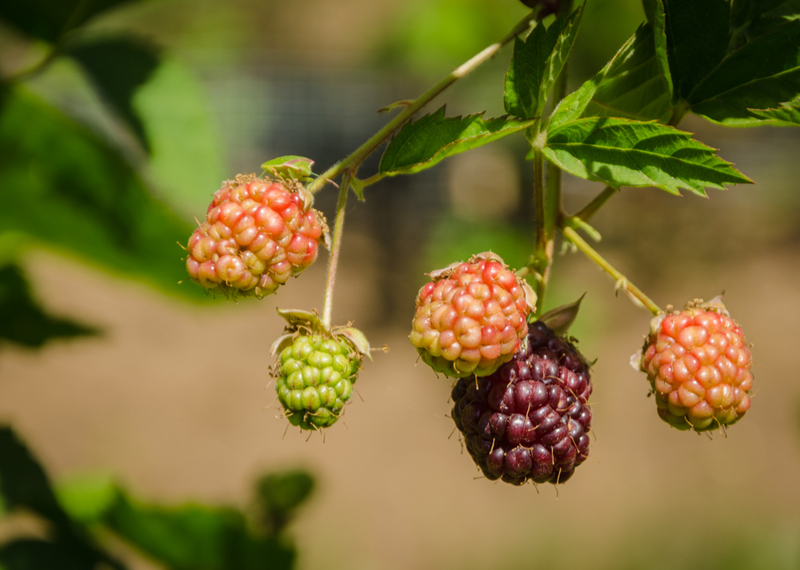 Stayed tuned for more jelly bean knowledge……today we tour the factory. 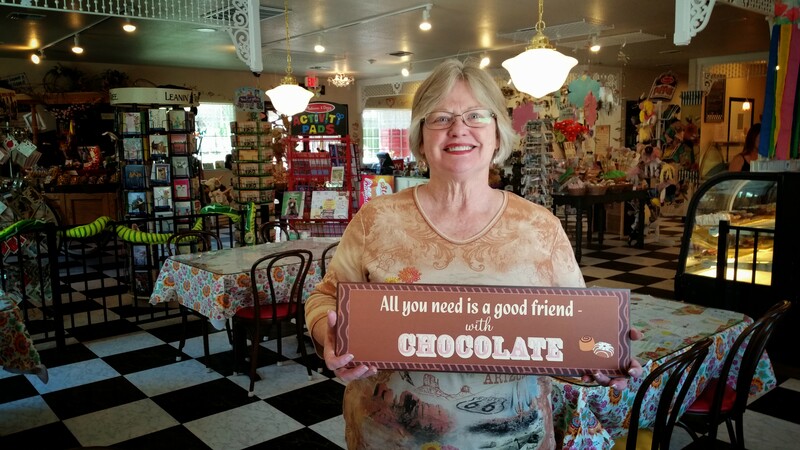 Charlene receives a free chocolate covered strawberry to celebrate Mother’s Day! Today was a nice day to celebrate Charlene being a Mom to two wonderful people that each have wonderful spouses. We went into Coarsegold to their Farmer’s Market. We bought some wonderful biscotti last week at a Farmer’s Market in Oakhurst and the woman who made it had a booth at the Coarsegold Farmer’s Market today. We told her how much we loved what we bought last week. Today we bought Chocolate Walnut Biscotti and Lemon Blueberry Biscotti. They should be heavenly! There was another vendor that was selling different goat’s milk soaps. He brought two little goats with him. One goat was 10 days old and one was 6 days old. They were incredibly cute! The 6 day old goat was a little shaky on his legs. Although the goats were being bottle fed, but they were nibbling at the grass in their pen. Charlene enjoyed petting the goats. After the Farmer’s Market, we went to have Mexican food for lunch. 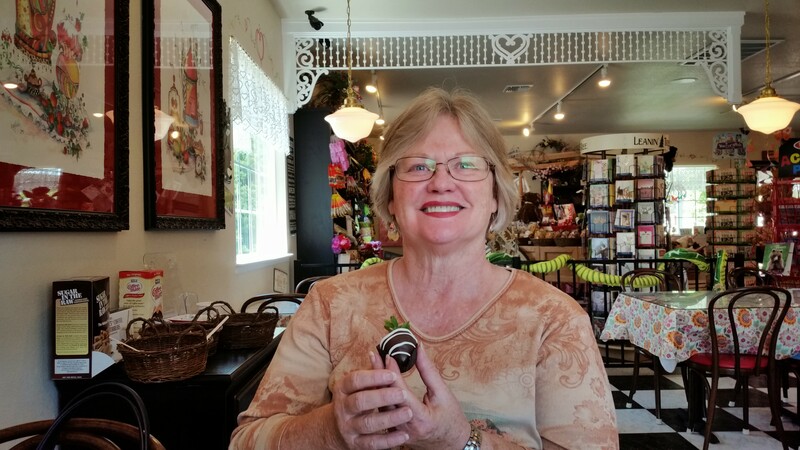 We almost ordered dessert for Mother’s Day, but then Charlene remembered a dessert shop in nearby Oakhurst. Once inside, they were giving away chocolate covered strawberries to mothers. Charlene ordered a chocolate gelato and Ed ordered blackberry ice cream. Both were fantastic! 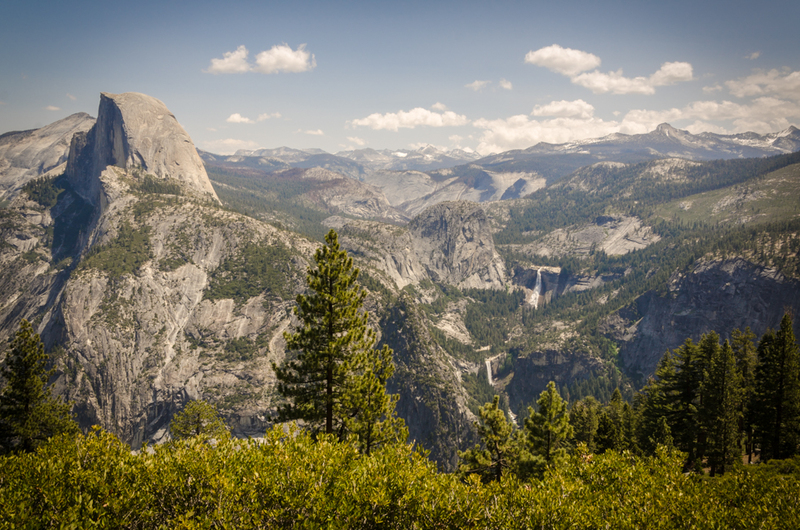 View from Glacier Point with Half Dome, along with Nevada and Vernal Falls. Today was superb! 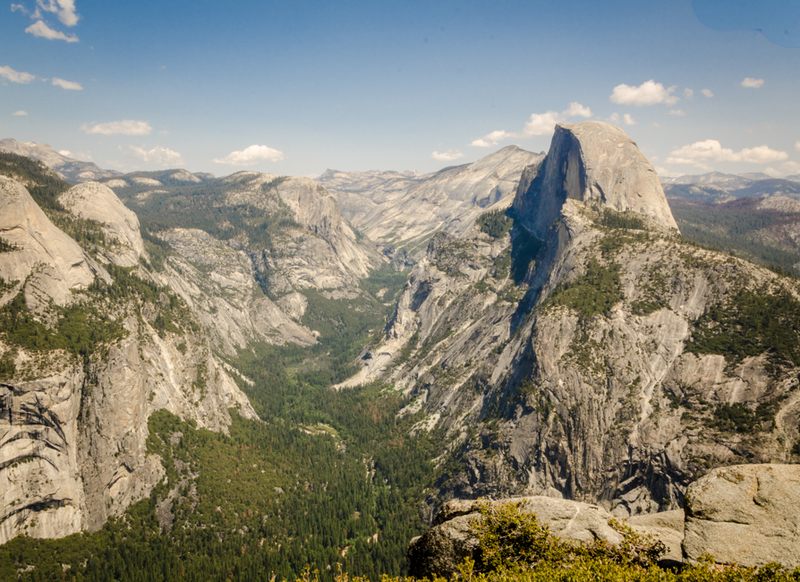 We drove to Glacier Point in Yosemite and enjoyed an incredible view of Half Dome with Nevada and Vernal waterfalls. Everyone seemed to stop and stare at the beauty. 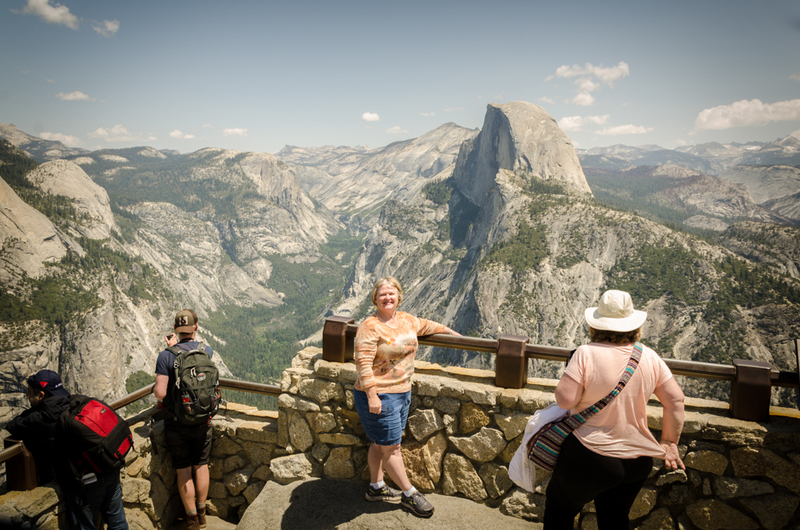 Charlene and others enjoy the view from Glacier Point. Next, we drove to the trail head of the hike up to the top of Sentinel Dome. The final hike up the dome was steep and it was very windy and cold. However, it was wonderful to be able to see almost 360 degrees all around Yosemite. Panorama composite photo from the top of Sentinel Dome. The photo is a panoramic merge of 5 photos from the top of Sentinel Dome. It covers about 225 degrees in a panorama. 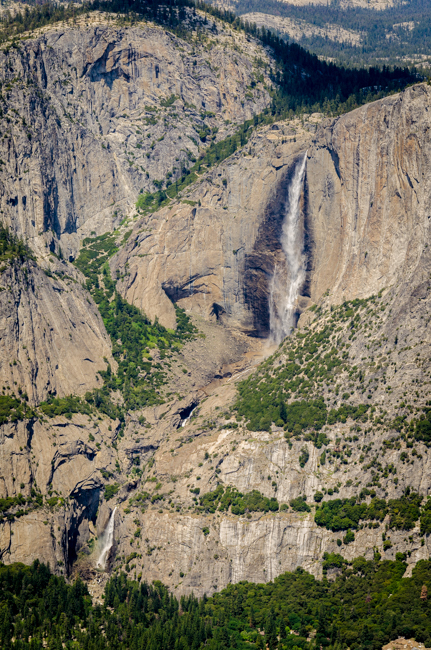 El Capitan is toward the left, Upper and Lower Yosemite falls are in the middle, and Half Dome is toward the right. The white rocks were initially behind the camera. Today we discovered a local family farm. The couple running it have had it for 5 years and they now grow and raise all kinds of things. 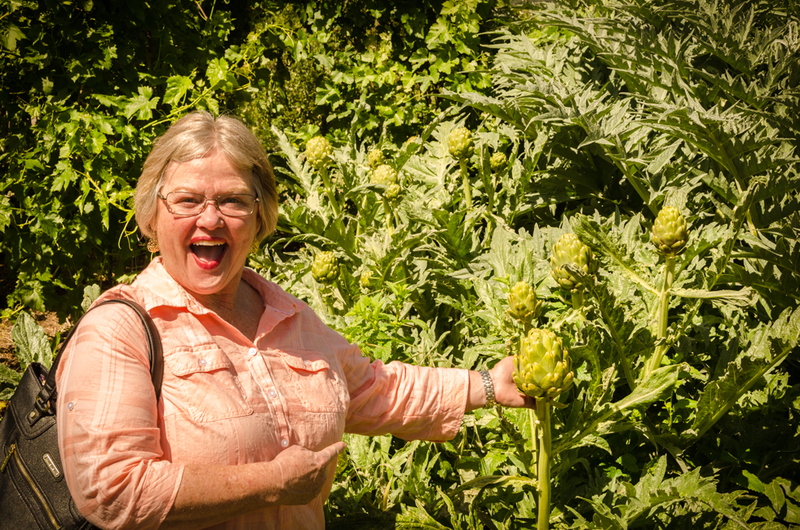 The most fun discovery was all the artichokes. 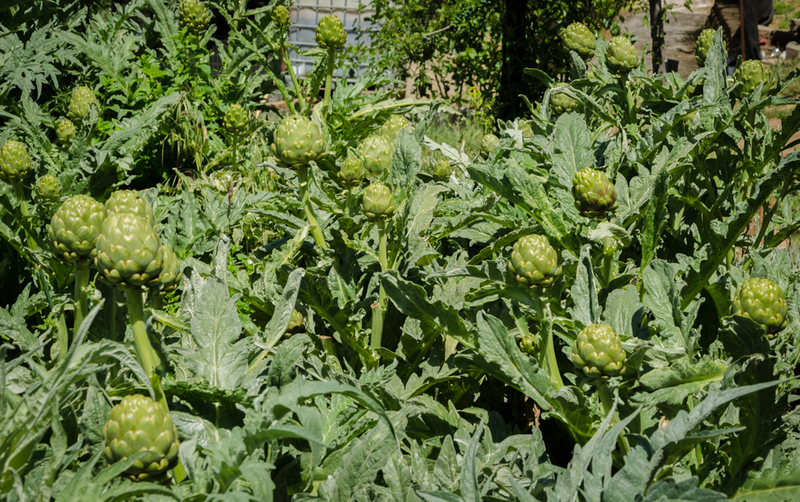 We have seen them in the grocery store, and we have eaten them many times over the years, but we have never actually seen artichokes growing in real life. They grow on a bush and we bought 4 large artichokes cut right from the bush! Awesome! We had fun learning about all their chickens. 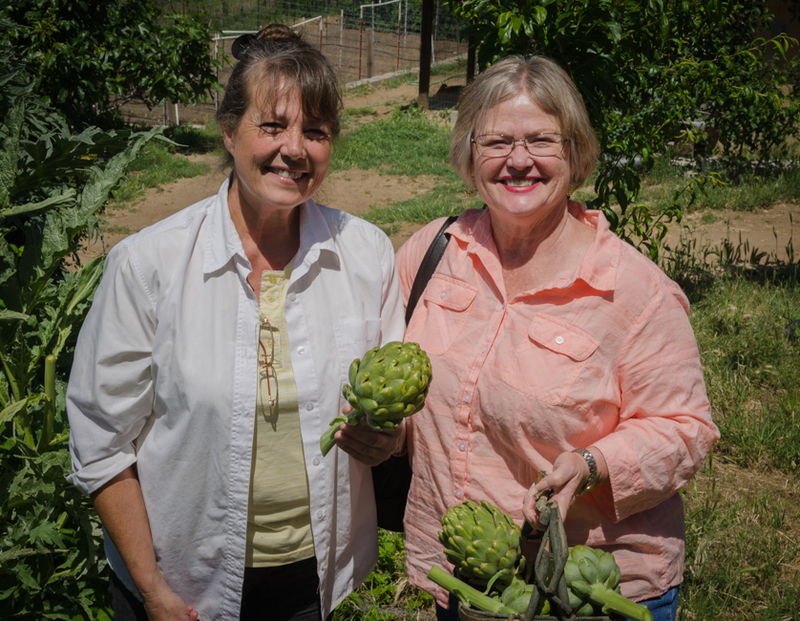 They have had bears and coyotes kill their chickens on several occasions. 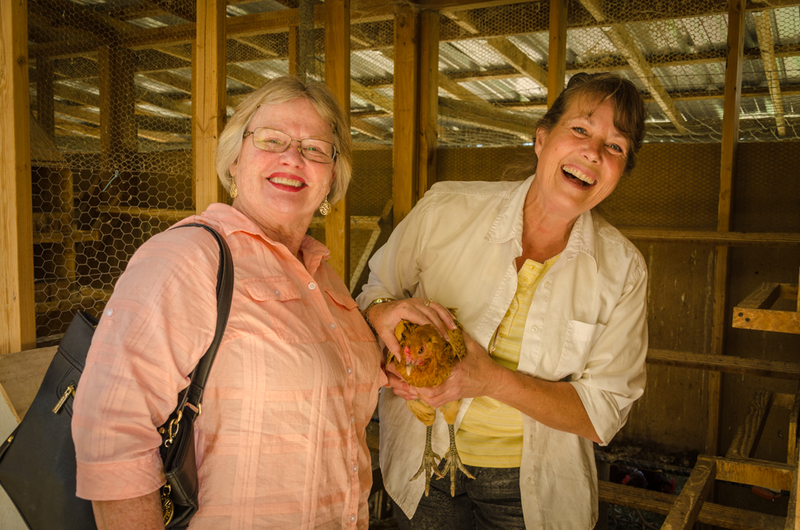 Charlene especially loved holding a chicken and learning about all their eggs. 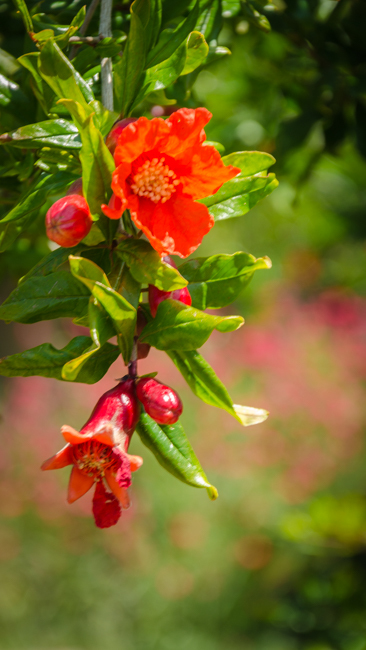 They grow pomegranates, avocados, strawberries, and blackberries too.